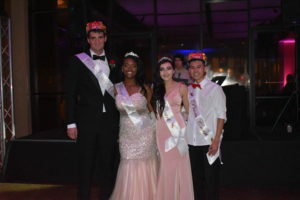 Aleksander Berg was crowned Prom King along with Leah Jones being crowned Prom Queen. Prom was held at the Annex in Hollywood, started at 7 p.m. and ended at midnight. Everyone was dressed like celebrities with the tight suits and nails done looking all nice. Some students felt prom was going to be lame, but it was everything but that. It started off the night with pictures and a specially prepared three-course meal. The food started with delicious Caesar salad for the first course; for the second course it was a fine piece of chicken and a potato puree; and then for the third course it was a sweet chocolate cake with strawberry drizzle. But the food was not the best part, the DJ was hitting the right songs and no one was sitting down. Even those who could not dance were dancing. Prom was literally a night to remember for the seniors and it is great way to go to graduation. May 13 was a night full of memories and no regrets.